One of the things I miss most when I’m away from China is this little massage place. I am a little (ok, a lot) spoiled because the massages here are so cheap and so wonderful. I usually go once a week! A friend discovered this little massage place just walking down the street one day and raved about it so I gave it a try a few days after she found it. That was over a year ago and I’ve been going religiously since then. Fortunately for me, it’s just across the main street and a very quick walk. It’s on Wenan Rd. (The street just behind the Sheraton Hotel.) Take a right at the “Mushroom Girl” restaurant, just past the Jiujiang Hotel down the little walking street. It’s at the end of that row of buildings on the left. It’s easy to spot from the English “Traditional Massage” on the outside. It’s simple and clean. The “doctors” here are trained in Chinese medicine and health and when they massage, they intend on “putting you back together”, kind of like Humpty Dumpty. Knotted muscles are like the devil in this place and they work on you until they are gone. If you are extra tight, this can get a little painful, but if you can suffer through it (if you can’t, just say so and they’ll ease up.) you’ll feel great tomorrow. Just the kind of massage I love! Wear comfy clothes for this one because interestingly enough you leave your clothes on. I really love these beds where you can lay flat on your stomach. I want one in my house… I’m a stomach sleeper. 2. Foot Massage :: Tried this for the first time a week or so ago. I had one once before at a different place and really didn’t like it because they tend to hurt. I was pleasantly surprised with this one because it felt great and was quite relaxing, especially after all the walking in Beijing from the few days before. 3. Guansha or “Combing” :: This is a traditional Chinese technique that involves rubbing a bone (I think), flat-looking, comb-with-no-teeth thing across your skin. He explained that it was often used when you feel sick with a cough or stomach-ache and it will make you feel better. I’ve never tried it myself. Supposedly, it uses the heat trapped in the cup to pull toxins from your body. I’ve never done it, except when Dr. Cao was explaining it for this post. Then he stuck one on the back of my shoulder to show me. It doesn’t hurt at all. Just feels like something is sucking on you really hard. And it leaves a big mean-looking hicky for a couple of days. I plan to try it again the next time I’m sick or need a pick me up. I have friends who swear by it. 5. 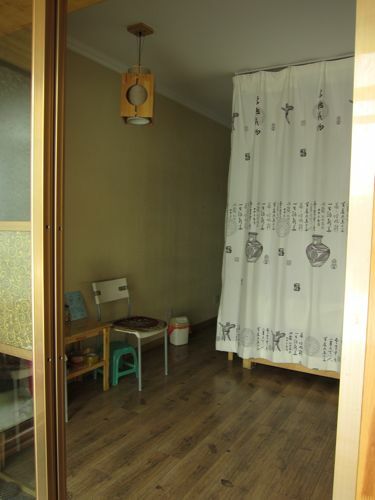 Chinese Herb Therapy :: This is a type of sauna where the boiling water is filled with Chinese herbal medicine. You lay on a bed made of wooden slats with the steaming pots underneath. If I understood correctly, I think they have different combinations for insomnia, weight loss, and other ailments. The sauna lasts 15 minutes and then it’s followed by an hour massage. You can do just the sauna if you’d prefer for 40 RMB. 6. The Best Massage: :: This is some combination of the above. Unfortunately, I forgot to ask which. I’ll try to remember to ask and update this the next time I stop by there. **Most of these say 60 minutes. In my experience, they are usually longer than 60 minutes… sometimes up to two hours. (Actually, the day I got the foot massage we started chatting about this post among other things and I was there for nearly 3 hours. And then he kept apologizing for being so slow with my massage. I certainly wasn’t complaining.) Tell them if you are on a time constraint, or just do like me and enjoy the extra time. In the afternoons, they’ll often ask if you want to nap after your massage and there are often people napping in the other beds. They believe this is good for your health. Dr. Mu is the senior doctor in the shop. I understand the word “doctor” is used loosely here as he has no medical degree in Western medicine but I will say, in my experience, he knows his stuff. In a lot of ways it’s similar to Chiropractics, except here they deal more with the body has a whole instead of just bones or just ligaments or just muscles. I have a knee injury I’ve been nursing for years. Recently, I had on a brace that I got from a doctor in the US. He had done an MRI, said there was nothing torn, spouted off a couple of possible diagnoses but basically said he wasn’t sure what it was and I just needed physical therapy and/or steroid shots into my knee that may or may not work. um. No, thank you. And physical therapy wasn’t an option since I was heading back here to China. Anyway, I had the brace on when I went for my massage because my knee had been bothering me. Wang Jian called Dr. Mu over take a look. He wiggled and rubbed in different places asking where it hurt. I can’t really explain what he did to it other it was like a combination of massage and chiropractics, but I walked out with it feeling much better. Since then, he checks on it whenever I go in. I won’t say he “fixed” it, but I will say I haven’t worn that brace much since then and it’s feeling better than it has in a long time. Whether you “believe” in traditional Chinese medicine or not, this little place is great! They are so friendly. Da Wang Jian, aka. “the Apprentice” speaks English really well. 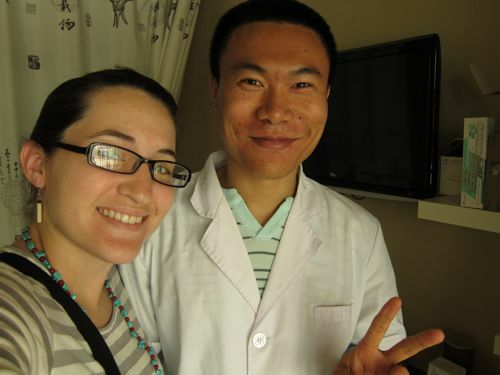 Dr. Cao always has a smile and has been learning English as well. I can’t believe how much he’s learned in the year I’ve been going there. When I first started, he could only say hello! Now he can almost carry on a conversation. Dr. Mu doesn’t speak any English but he always says “hello” (when he isn’t taking his afternoon nap!). I hope you’ll stop in and get a massage here sometime. I know they’d love to meet you and really, you can’t beat a $20 one hour massage! This entry was posted in Things to do by Country Fried Egg Roll. Bookmark the permalink. Shenyang is great once you discover all the little fun and quirky things about it. December is a rough time to move here though, just in time for the frigid winter. Remember to pack your big heavy coats and long johns… and remember Spring WILL eventually come around. Feel free to email if you have any questions! I’ve learned a lot about Shenyang just by reading your blogs. I’ve seen this site when i was looking for a good spa/massage place here in Heping District. I just arrived here in Shenyang yesterday and will be staying for a month or so. Thanks for sharing some tips and places to go here in Shenyang. Welcome to Shenyang! Where are you staying? Let me know if you need to know where anything is. Lots of fun hole in the walls in this city. Unfortunately I’m headed back to the US for about 6 weeks or I’d say we should meet for coffee. I’ve been in three hotels now since I got here in Shenyang, and I will be back to Jiujiang Hotel tomorrow. I’m glad my host is very patient and understanding with my requests. I’m not staying that long in Shenyang, but i find this city very interesting especially driving on the street with random drivers and pedestrians. lol. I’m from LA and my driving skill is no match with the drivers here, they are really crazy. lol. Yeah, we should meet one of these days for a coffee and share more of your survival tips in this beautiful city. Hi! Thanks for your blog, I’m really enjoying reading it. I’m moving to Shenyang in August so it’s great to see your photos and hear some stories, it won’t be too much of a surprise….I hope! Hi ! Nice to read that and hopefully this place is still serving the same Service. 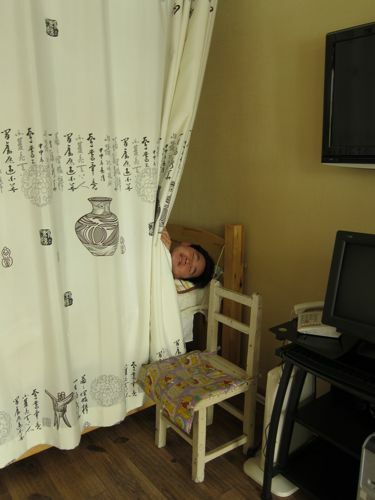 I am now for two weeks in Shenyang and was looking for a safe place where no other “special services” are given. I stay close by in a Hotel just walking distance and Ive seen this place few times by walking in front of it.But was just not sure . I will give a try.